SHANGHAI, Dec. 26, 2017 /PRNewswire/ -- In 2018, as an important theme show of Hotel Plus event, Shanghai Hospitality Design & Engineering Expo will be renamed as Shanghai Hospitality Design & Supplies Expo due to the move-in of the exhibits of FITNESS & LEISURE, APPLIANCE & AMENITIES, IT & SECURITIES and TEXITILES from Hotelex Shanghai. After the integration, Shanghai Hospitality Design & Supplies Expo 2018 host by UBM Sinoexpo will be the biggest show in hospitality industry in Asia with the exhibition space of 80,000 sqms and can better help developers, designers and hoteliers to find new products, technologies, services and solutions that are related to the hotel and other commercial built environment. Shanghai Hospitality Design & Supplies Expo 2018 will be held during April 26-29, 2018. With 4 months to go, 95% of the space of Shanghai Hospitality Design & Supplies Expo 2018 has been sold out. All kinds of conferences and activities are being carefully designed. Well-known Italian design master Piero Lissoni has confirmed his presentation in one of the conferences. Thanks to the attribution of high quality, well design and lower price, sanitary ware in HDE show becomes a very important purchasing category for the developers, hotel owners and designers in the exhibition. HEAN Kitchen and Bath Technology (Shanghai) Co., Ltd.
Fresh and natural bathroom space will also present a calm and comfortable feeling. HEAN · Pure Brook selects stones of unique texture and restores the flexibility of clear blue waves, leaving the entire bathroom space to become vigorous. The design of the bottom refers to the natural and beautiful landscape of gurgling brook, and delicate texture will bring the sense of water flowing through the soles of feet, as if back to nature. When bathing along the brook, you'll find the water pure and flexible and the mind delightful. 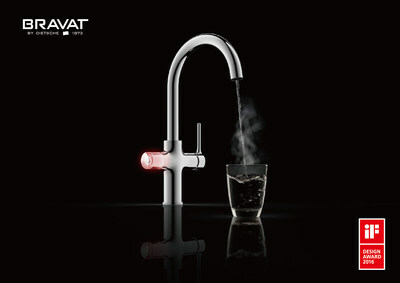 Bravat is the high-end brand of kitchen and bath products owned by Roman Dietsche, German sanitary ware provider founded at Yr.1873. We provide one-stop kitchen & bathroom solution to high-end customers with full ranges of sanitary products. The German exquisite workmanship assures that Bravat always brings you a healthy and comfortable bathroom experience. Innoci team originate from Germany, which focus on sanitary ware design and develop product for worldwide. Innoci bathroom concept base on European fashion style and humanization design. Innoci sanitary ware settled in Chinese market since 2012, which integrate with Dongpeng Holdings, one of the largest tile & sanitary ware manufacturing group, and set up Guangdong Innoci Sanitary ware Co., Ltd. for manufacture, product sales and the whole bathroom space concept. Sales / service network radiates to China, Germany, Singapore, Taiwan, Malaysia, Japan, Korea and more than 30 countries and districts. More product news in other halls will be released soon, please stay tuned with us.